Why should I choose Integrity Design + Build, LLC for my home remodeling project? We offer a 2 year written warranty on all workmanship and take the necessary time up front to ensure that you’re getting the right job for your specific needs. We are a customer service company first, meaning we answer and return calls promptly and show up on time for appointments. We have a highly skilled in-house crew as well as top quality subcontractors so you receive a grade A quality job, regardless of the project’s scope or size. We stay on top of new products so you will always get the best quality materials available to keep your home looking great for the long haul. Why is insurance or worker’s compensation important? With any type of home improvement work, even when all proper safety procedures are followed, there is always the risk for accidents. Some jobs may require ladders or scaffolding, others may require power tools. With these things in mind, isn’t it great to know that your home is covered by $3,000,000 liability coverage and everyone working on your home is covered by full Worker’s Comp? Most homeowners don’t realize that if an employee of an insured contractor gets injured on their property, they are ones liable for any medical bills, not the contractor! Click on the links to view our Class A Contractors License , Liability Insurance and Workers Compensation. In today’s world you get what you pay for. With that in mind, we are certainly not the cheapest contractor in town nor are we the most expensive. In fact, we fall right in the middle. When comparing our prices with companies that have the same licensing, insurance, written warranties, experienced crews, top quality materials, and exceptional customer service, you’ll discover that Integrity Design + Build is by far the best overall value in Central Virginia! Why should I trust Integrity Design + Build to ensure proper work and to make sure my project run smoothly? Our knowledgeable management team is with you every step of the way- from the initial consultation, to the final walk-thru. We will be inspecting each step of your project and keeping you as informed in the process as you wish to be. Just check out our references to see some of the work we’ve done! At Integrity Design + Build we feel that it only makes sense to use the highest quality materials that the market has to offer. The major cost of any home improvement project is always the labor, so why skimp on materials? If you’re painting, we recommend using Sherwin Williams Duration. This paint carries a limited lifetime warranty and provides a layer of paint about as thick as a credit card! If you have basic carpentry needs, we recommend always using treated woods, pre-primed woods, or even composite PVC for your exterior. If you’re looking to have your siding replaced, we suggest using a high quality cedar siding or the top of the line James Hardie Cement Fiber Siding. When it comes to decking we recommend Trex Composite or Azek PVC lifetime warranty decking. If you’re looking to have a roof replaced, we install GAF/Elk 30 year, 40 year, and lifetime warranty shingles. When it comes to windows and doors, we install all major brands including Pella, Therma-Tru, Marvin, and Andersen. How experienced are your crews? You can be sure that there will always be an experienced man on every job-site. Our project managers, crew chiefs and service partners average over 15 years experience in their trade and are trained regularly on the latest tools, techniques, and safety procedures. We focus on what we’re great at: residential remodeling and replacement services. Our Home Services division offers roofing, siding, decking, window and door replacement services. We also offer all types of interior and exterior painting, drywall repair, as well as deck, front porch, screen porch, sun room, and addition construction services. The great thing about having skilled craftsmen and a fantastic network of subcontractors is that there is rarely a project that is too much for us to handle. View more details on our Services page. 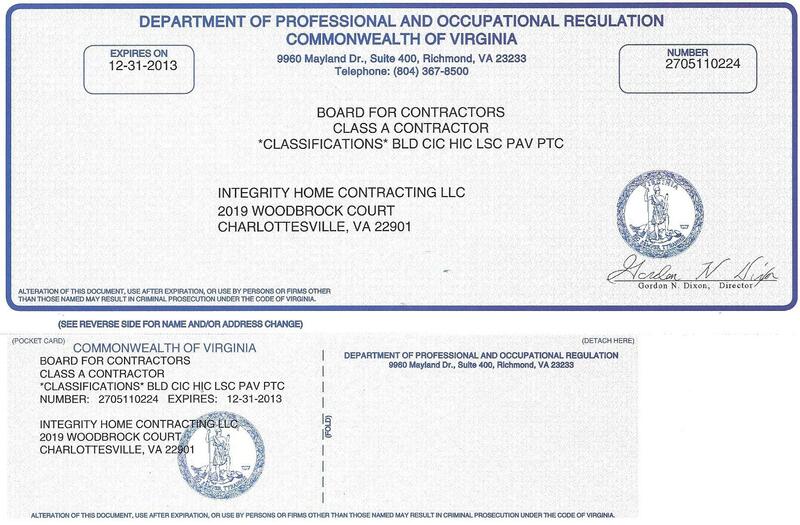 Integrity Design + Build, LLC has a Virginia Class A Contractor’s license; we are incorporated through the Virginia State Corporation Commission, and are licensed by the County of Albemarle.